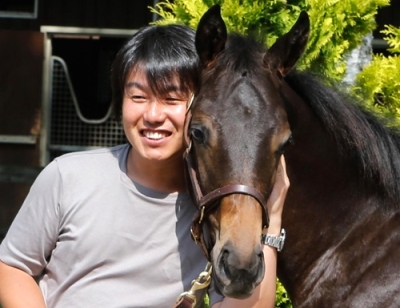 OBS graduates were in the headlines at Tuesday’s Japan Racing Horse Association Select Sale of yearlings and foals, as a weanling colt by leading Japanese sire Deep Impact (JPN) out of two-time OBS graduate Weemissfrankie was sold for $1, 372, 550 to young Ryouichi Ootuka. The colt is the first foal out of the daughter of Sunriver, consigned first by Summerfield, Agent, to the 2010 August Sale before she was sold for $175,000 by Eddie Woods, Agent, to Joe Ciaglia at the 2011 April Sale. Trained by Peter Eurton and racing for Sharon Alesia, Bran Jam Stables, Ciaglia Racing LLC & Ron Dyrdek, she won three of five starts including the Del Mar Debutante Stakes (G1) and the Oak Leaf Stakes (G1) at Santa Anita. A weanling colt by Deep Impact (JPN) out graded stakes winning OBS graduate May Day Rose was sold to David Redvers for $647,039. In the colors of Kaleem Shah and trained by Bob Baffert, the Florida-bred daughter of Rockport Harbor won the Santa Ysabel Stakes (G3) at Santa Anita and Hollywood’s Railbird Stakes (G3) en route to earnings of early $400,000. Consigned by her breeder Bridlewood Farm to the 2010 OBS March Sale, she failed to meet her reserve but was purchased by trainer Bob Baffert on Shah’s behalf for $220,000 at the OBS June Sale three months later. A colt out of three time OBS graduate Two Item Limit, also by Deep Impact (JPN), was sold to Hajime Satomi for $647,059. The daughter of Twining was sold first by Beth Bayer to R. Schweiger and Coastable as a weanling at the 1998 Fall Mixed Sale before she was resold to Jockey Club Farm at the 1999 August Yearling Sale. After she was purchased by Joseph Graffeo from Jockey Club Farm for $50,000 at the 2000 March Sale, she was trained by Stephen L. DiMauro and carried Graffeo’s silks to four graded stakes wins and earnings of $1,060,585.